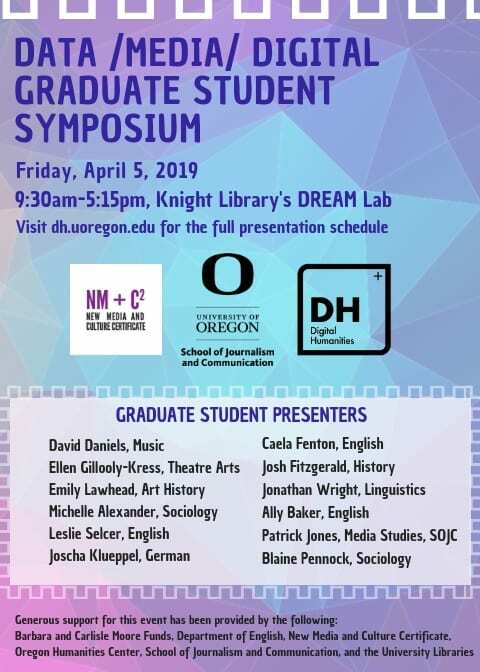 This Friday, April 5, the New Media and Culture Certificate, DH@UO, and the School of Journalism and Communication are co-hosting a Data/Media/Digital Graduate Student Symposium. The symposium will take place in the new DREAM Lab, located on the first floor of Knight Library. To see the full list of graduate student presenters and the schedule, click here. The event is free and open to all. We hope that you will join us! Looks like a well-planned event. Should be very interesting. Thanks!